Washington, Jan 11 (Just News): The US President Donald Trump threw his weight behind the Olympics-inspired diplomatic opening with North Korea, telling South Korea's leader Wednesday that the U.S. was open to talks with Kim Jong Un's government under the right circumstances. A White House statement said Trump and South Korean President Moon Jae-in still agreed on the importance of continuing the "maximum pressure" campaign against North Korea over its development of nuclear weapons - the U.S.-led barrage of international sanctions that is starting to bite the North's meager economy. The prospects of resolving decades-old tensions on the divided Korean Peninsula remain deeply uncertain. North Korea has shown no willingness to discuss its nuclear weapons which pose an emerging threat to the American mainland, and it has stuck to its tough stance toward Washington while it tries to woo the South. The newspaper of the ruling party on Tuesday called Trump a "lunatic" and said the U.S. needs to accept North Korea is now a nuclear power. Speaking later Wednesday, Trump claimed his administration's pressure campaign had prompted the North Koreans to negotiate with the South, and recounted Moon as telling him the initial meeting was "extremely good." He voiced cautious hopes for diplomatic success that would benefit not just the United States but the wider world. He played down fears of war. "We have certainly problems with North Korea," Trump said at a news conference. "A lot of good talks are going on right now. A lot of good energy. I see a lot of good energy. I like it very much what I'm seeing ... hopefully a lot of good things are going to work out." Moon has been supportive of the pressure campaign but has long advocated engagement with Pyongyang. He told reporters in Seoul Wednesday that he's open to meeting with Kim to resolve the North Korean nuclear standoff, although he said the success of such a summit must be guaranteed before the meeting can be realized. Trump has previously scoffed at the futility of talking with the North, but when the inter-Korean dialogue was proposed last week he claimed credit and declared in a tweet, "talks are a good thing." The White House said Moon had briefed Trump on the outcomes of the North-South talks on Tuesday, and "thanked President Trump for his influential leadership in making the talks possible." A National Security Council spokesman, who was not authorized to be quoted by name and requested anonymity, said Trump assured Moon that press reports suggesting the U.S. was considering imminent, unilateral military actions against North Korea were false. 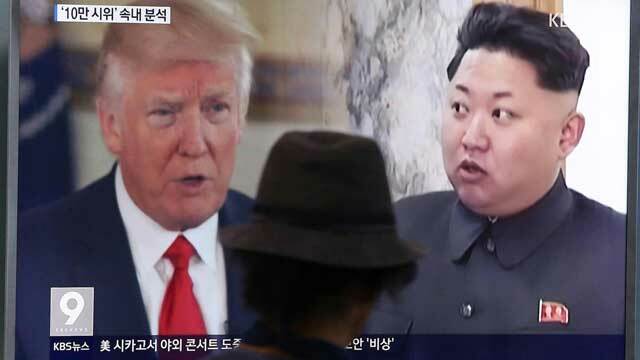 Yonhap reported that Moon's chief press secretary, Yoon Young-chan, said Trump also offered assurance that military force would not happen while the two Koreas continue to talk. The prospect of military confrontation has been magnified in the past year as Trump and Kim have traded bellicose rhetoric and crude insults, as the North has conducted its sixth and most powerful nuclear detonation and three tests of intercontinental ballistic missiles that now put the U.S. mainland in North Korea's range.